To me, no other country has summer holidays written all over it than Spain. Having grown up in Germany, summer trips to Spain were annually kind of mandatory. Spain and summer belong together such as the refreshing ice in ice tea and sand on the beach – but there’s so much more to the country than just beaches, Ballerman and the certainty that every day will be filled with sun and heat. Last year, I planned a different summer holiday than the usual one – a round trip to explore more of Spain’s culture, learn about its versatile nature and of course there was time for a little break on the beach with ice cream. Away from the partying and retiring Germans in Palma, Mallorca positively surprised me with its diversity. Wherever you go, you can tell the island is wealthy and invests a lot in tourism. The streets are neat and modern, the villages still sleepy and untouched though very well connected with the infrastructure, there are hiking paths for you to get lost along the coast or simply the fact, that wherever you go in Mallorca may it be to the lush vegetation in the mountains or the crystal clear coves at the coast, you’ll always find an excellent restaurant serving local cuisine and fine dining experience. I can highly recommend the beautiful Boutique Hotel & Restaurant Cas Xorc which is located right at the top of a mountain in between overgrown greenery and gardens. Built in typical historic Mallorcan style, the hotel is a popular wedding venue and I can totally see why. It was completely hidden away and there wasn't even a sign on the road. At some point, there was a dusty little sideway, very narrow and hard to navigate around and difficult to manoeuvre by car. After 20minute fine-tuning and inch by inch work up the winding path with the car, I made it. Olive trees and lush greenery awaited, lemon trees and rose gardens filled the air with a heavenly scent. In the shadows of olive trees, I enjoyed lovely views over the area and a light summer lunch. This is definitely an insider tip and was the highlight of my trip. You can also spend sunny afternoons in cute cafes in local villages, enjoy cake and do some people watching. Port d'Andratx and its harbour were white boats rock softly in turquoise water are perfect for people watching. Then you can also discover abandoned coves with water so warm it resembles a bathtub, snorkel through the underwater world or simply enjoy the flora & fauna high up in the mountains. There’s literally so much to do and to see. If sightseeing and shopping are more your thing, go to Palma. The capital is officially my new city crush as it boasts the usual High Street sellers in a modern, clean and very historic environment. Many favourite brands such as Zara or Massimo Dutti are Spanish, so you’ll pay a fraction of the usual costs in comparison to buying in the UK. Roaming Palma’s streets to find little boutiques and admire its traditional colonial architecture is pure joy. Don’t forget to visit the cathedral which will impress you with its medieval charm and remarkable construction. The outskirts of Palma are home to many internationals who have gathered here in settlements: if you need your German hairdressers or doctors – well, there is. If you need a local German to help you buy a house – you can. There’s even a garage for your car repairs or a scooter rental. Especially in the summer, renting a scooter and exploring the island by yourself is a lot of fun. The island stretches some 100km into all directions but you’ll never get lost as the transport network is so well built and established. From the Soller Mountains in the North to the coves in Cala d’Or in the South East or the Mediterranean terracotta trail in the West, I found Mallorca has a lot to offer and to discover. Or if you want a day trip to Ibiza, Formentera or even to the mainland, you can do so as the airport is very accessible and flights f.ex. to Barcelona are only 40 minutes away. The only downside I saw with Mallorca is its temperamental weather – because the Mediterranean Sea is sandwiched in-between the continents, the climate tends to be somewhat uncomfortably humid. 26 degrees can turn the air very nastily into hot as hell which also supports the population of bugs and vermin. Unfortunately, you can tell and see a lot of it flying and crawling around which is a bit of a shame really. However, this shouldn’t put you off from visiting as otherwise, you’ll miss out on a fantastic island that is so versatile and has a huge range of activities to offer. I can’t wait to return this year and explore more remote parts of the island and indulge in its exquisite fine dining scene. Barcelona has to be one of the most inspiring city trips I’ve ever been to and my visit last year will definitely not be the last one. I would even rate the trip on the same level as my sightseeing in Rome experience from 2016 and here’s why: located right by the coast in the sunny South of Spain, Barcelona offers you the perfect mix of sightseeing, shopping and beach holiday. First things first – the sightseeing. The city’s iconic landmarks from Gaudi are simply breath-taking. If you have the chance to see the surrealistic buildings such as Casa de Batlo, Casa Mila, the Sagrada Familia or Park Güell please go for it. You will regret it in your life if you’ve never made it to Barcelona to see and enjoy the genius of artwork that has been created by Gaudi. Even if art is not your thing, no one can escape the fascination and magic that Gaudi’s lifework exudes. Book your tickets in advance and don’t be put off by the rather expensive entrance fees, they are worth it. Admire the futuristic architecture inside the Sagrada Familia and imagine yourself living in one of the houses in Park Güell. Especially the later invites you for hours to stroll around, see Barcelona in a stunning 360-degree view and hosts Gaudi’s house where he lived till his death. As the park is in the North of the city, I would suggest starting here first, and then slowly walk downhill towards the Sagrada Familia that towers over the city. Whilst you walk towards it, you’ll pass through suburban neighbourhoods, leafy alleys and neat streets that follow a regular pattern – from above, Barcelona’s city structure actually reminds me of a sushi board. Getting lost in Barcelona is easy, but also to find your way back. I’m thinking of the labyrinth-like Gothic quarter with its narrow, mysterious alleys that boast of unique shops and eateries. The Barcelona cathedral and parts of the city wall in this quarter will impress you equally and wherever you go, it feels like the city is one giant shopping mall. There are tonnes of shops everywhere which buzz with people. In general, the city is super lively, there’s live music and street artists everywhere. At night there’s the habit of half-naked men performing in the streets which is quite nice for the female eye to watch. Las Ramblas, the cable car by the harbourside, Ciutadella Park or the beach with the iconic W Hotel are all famous places worthy of a visit. I loved the vibrant energies of the city which never felt as exhausting as the chaotic hustle of London. People are literally everywhere enjoying themselves, the weather, the extraordinary food, the beach or simply Barcelona’s relaxed lifestyle. Vibrant, young, cultural and arty is how I would describe Barcelona and I can highly recommend it as a summer getaway. Sunshine, 35 degrees and the guarantee that every day will be pretty much the same are the reason why I love the Canary Islands. Their location so far out in the Atlantic is another plus as it means that unlike the Balearics, there's a light cool breeze and you won't feel the heat as unpleasantly humid but rather dry. This also means there are fewer bugs and in general, a cleaner environment but enough said about cleanliness and the weather. Last year I actually managed to go twice to Gran Canaria as I found an absolute gem of a hotel and I loved spending more time there. The hotel is Santa Monica Suites Hotel, a four-star boutique complex located directly by Gran Canaria’s famous dunes. It was love at first sight: there are incredible views over the dunes teamed up with palm trees and a glistening blue ocean on the horizon. At night, the vast open space allows you to watch the stars and listen to the soft sound of the waves. The hotel itself is very new and modern with its own private access to the dunes. It’s rare that I can sleep and fully wind down at hotels, but during my stay(s) last summer, I never felt more relaxed from a holiday than coming back from Santa Monica. The hotel is medium-sized, very stylish and seems to target young couples. I've rarely seen any children and if there were some, they were usually really well behaved. So no screaming kids, no fights for sunbeds in the morning, nice food and comfy beds made my holidays unforgettable. Gran Canaria offers lots of water sports and whale watching from Puerto De Mogan but the island itself, especially the touristy area around Maspalomas/Meloneras/Playa del Ingles in the South, has not much to offer. In fact, unlike in Tenerife, the area is quite rundown and outdated. The island is worth visiting if you appreciate a nice endless walk at the beach as the dunes invite you for a long stroll along the sea and in general, just crave some very quiet relaxing time – and if you love star gazing than this is the spot for you. There’s nothing more memorable than sitting in the dunes, feeling the warm sand and watching the stars come out. I’ve been to Canaria's Palmitos Park in the past which is not a comparison to the Loro Parque which I visited during my holidays in Tenerife. Gran Canarias capital Las Palmas is unfortunately pretty rough. If you seek some nice restaurants or shopping areas than I would definitely recommend to stay in Tenerife rather than in Gran Canaria. At the time of my visit, I was craving nothing more than a nice beach and some peace to read my book The Alchemist by Paulo Coelho. It's a wonderful coming off age tale of a young boy who grows into a man on his journey to find a treasure which is supposed to be buried at the pyramids in Egypt. The setting takes you through Andalusia and the desert in Morocco, so with the backdrop of the dunes of Maspalomas, I felt closer to the book and its spiritual message. Anyway, that was last year's Spain Round Trip and it offered the perfect mixture of nature, sightseeing and beach holiday to me. 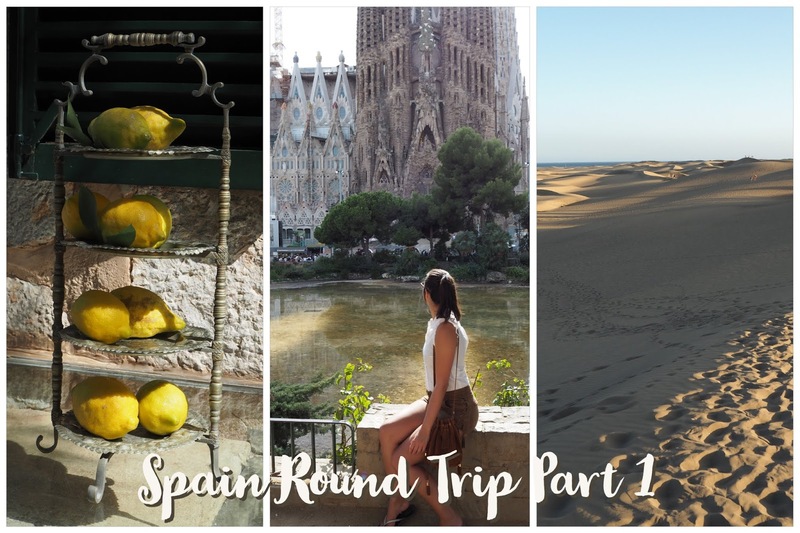 I hope this post has inspired you to explore more of Spain as there's so much to see and do. This summer I will return and travel to the North as well as to the South of the country. Keep your eyes open for my Spain Round Trip Part 2 coming later this year. Thank you so much for reading and till next time.